There’s a danger with seeing something available for pre-order well in advance, at a massively-discounted price. Case in point? 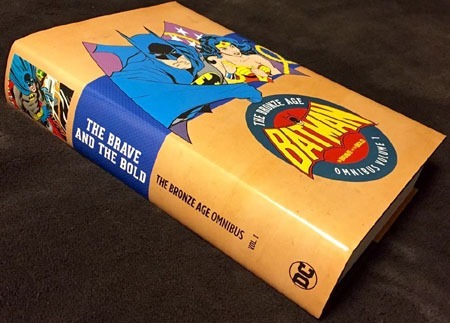 Batman: The Brave and the Bold – Bronze Age Omnibus vol. 1. I apparently pre-ordered this some time back, for a great price…but completely, totally forgot about it. And then I received a notification from Amazon. My “order” had shipped. I would not have preordered it if I wasn’t interested…but I had not consciously planned for the book, nor even remembered it was due out…and did not note it in any stores. 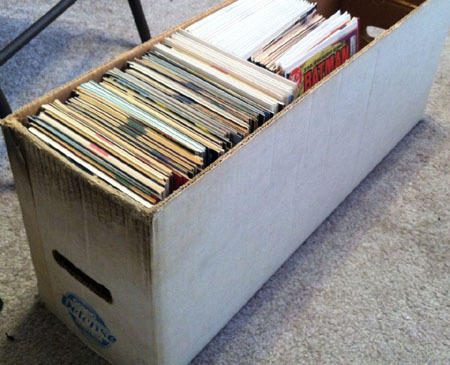 I’ve been increasingly interested in the _____: The Golden Age and _____: The Silver Age volumes in paperback…but hadn’t really figured to snag any of the hardback Omnibus volumes. Guess there’s a first time for everything, though! 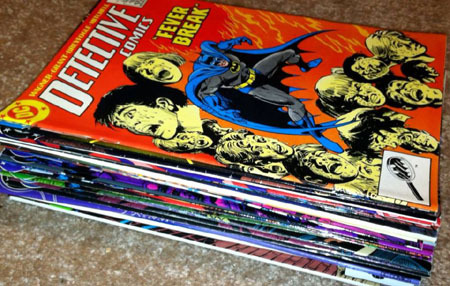 I also scored a handful of Detective Comics issues…a couple from earlier in the run as well as some early 600s+. 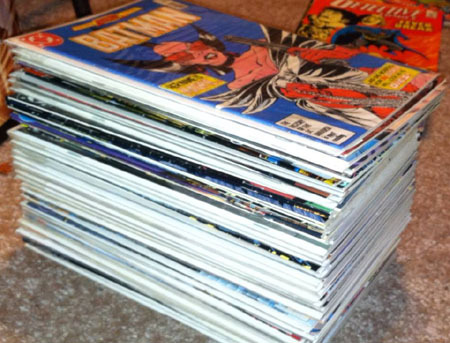 This was a small-ish stack, but until now, it’s seemed MOST of my “main title” Batman acquisitions have been Detective. 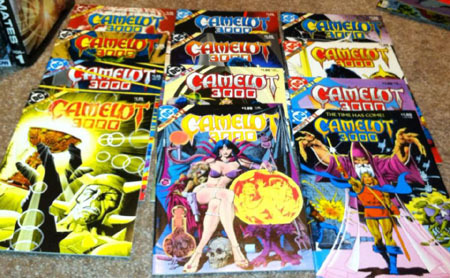 I snagged the entire Camelot 3000 run since all 12 issues were there. Been meaning to read this in one format or another for awhile…this should help accelerate my getting around to reading it. And definitely can’t beat the price. 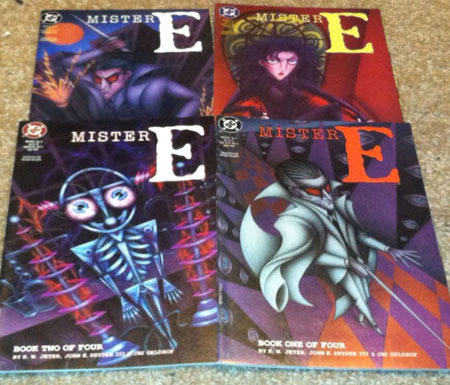 Nothing like finding an entire maxi-series for the same price as (or less!) than most current comics. I grabbed these 6 Brave and the Bold: Green Arrow/Butcher/Question issues since it looks to be the entirety of a mini-series. 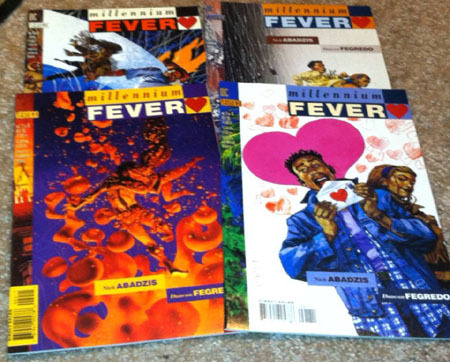 While I’m not a fan of mini-series for newer comics/off-the-shelf purchasing…I quite appreciate them when I find complete minis in the bargain bins. 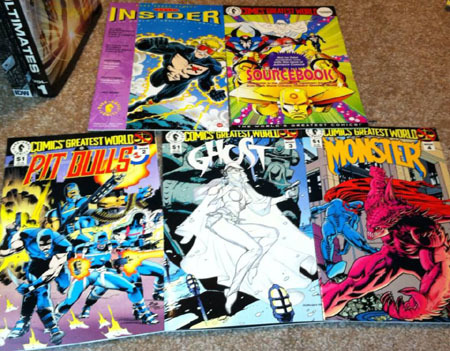 I figured I’d fill out a new copy of my Comics’ Greatest World collection…here’s the “regular edition” Sourcebook, as well as the Dark Horse Insider “magazine” with some stuff about CGW. A complete mini-series..and this’ll go well with my expanding on my ’90s Superman collection, as it’s a “tie-in” mini of sorts… I don’t consciously recall knowing about this series, even back then. 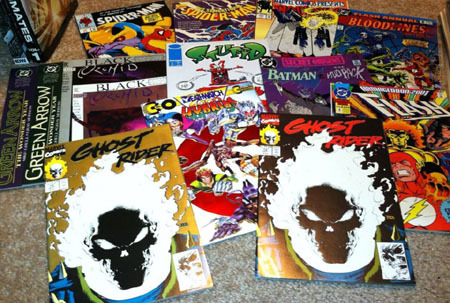 So finding the entire thing in one place…for half the cost of a $2.99 comic…another great find! 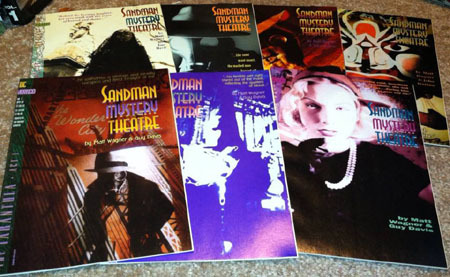 Another complete mini-series. No clue what it’s about, but it’s early Vertigo, and it’s a 4-issue mini, so why not? 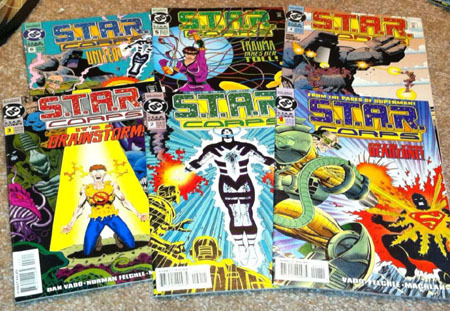 It’s been a long time since I picked up any issues of this series–it’s one that seemed to have a promising concept, but just didn’t strike me as “mattering” all that much, and so I didn’t keep up beyond the first couple issues and a random issue or two I’ve scored from a bargain bin. This issue is one in which the cover was extremely influential–far, far moreso than most comics (since I usually walk into the store already having decided what I’m going to buy). This one I saw on the shelf, and the combination of the cover image and the characters being put together (Booster Gold & Magog) made for something I was actually interest in checking out. The cover image of a grim Magog–shadowed face, angry-Booster reflected in his armor–reminds me a bit of that classic Wolverine vs. Hulk cover (whether it was intended to or not). I’ve enjoyed the most recent incarnation of the Booster Gold series, and his post-52 status quo has been interesting and really done a lot for the character in my mind–giving him a lot more purpose and credibility. And given the events at the tail end of the Thy Kingdom Come epic in Justice Society, I’m quite interested in seeing how the “new” Magog is handled, as there’s more to this version of the character than what had been running around the DCU for much of the past decade. This issue opens with Booster and Skeets racing to the time lab in response to alarms, and finding mentor/leader Rip Hunter materializing, apparently in battle with someone. Working the Time Platform, they isolate Rip, bringing him back without his assailant…but with a scrap of a Superman costume from another time/world. When Rip forbids Booster from investigating Magog’s future (the assailant), Booster decides he can at least begin researching Magog in the present. 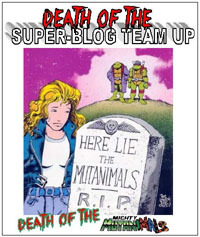 Booster’s investigation leads to an encounter with Magog where the two–with vastly different methods–attend to a hostage situation and terrorists. On the whole, this issue really felt like an issue of Booster Gold. Jurgens and Rapmund on writing/art are quite familiar to me recently for their work on the Booster Gold title. That said, the art for this issue is quite enjoyable–the visuals by this creative team make for my favorite depiction of Booster & co., and the take on Magog leaves me with no problems, either. The story, too, felt like (despite being a single-issue/on-off tale) it really belongs in an issue of Booster Gold (and would have been a perfect filler in place of what we got in Booster Gold #20. As the creator of the character, Jurgens knows the character and supporting cast, and seems to have a good grasp of what makes for a good story with them. He also adds some depth to Magog, and sets up what could be an interesting relationship between Booster and Magog, given the nature of the characters and time travel. This seems a great issue to snag for a single-issue enjoyable read. It doesn’t seem to be directly continued from any prior cliffhanger, and it leaves on a satisfying ending that does not require one to jump right into the next issue for a cliffhanger’s resolution. As a one-shot, regularly-priced ($2.99) comic, this is easily the best comic of the week for me. Highly recommended for readers of Booster Gold, or fans of either character.